The College of Humanities and Social Sciences (CHSS) at Hamad bin Khalifa University (HBKU) signed a milestone Memorandum of Understanding (MoU) with Doha Film Institute (DFI) this week. The MoU calls for long-term collaboration between the college and DFI in the areas of education, professional training, and audiovisual translation and interpretation. 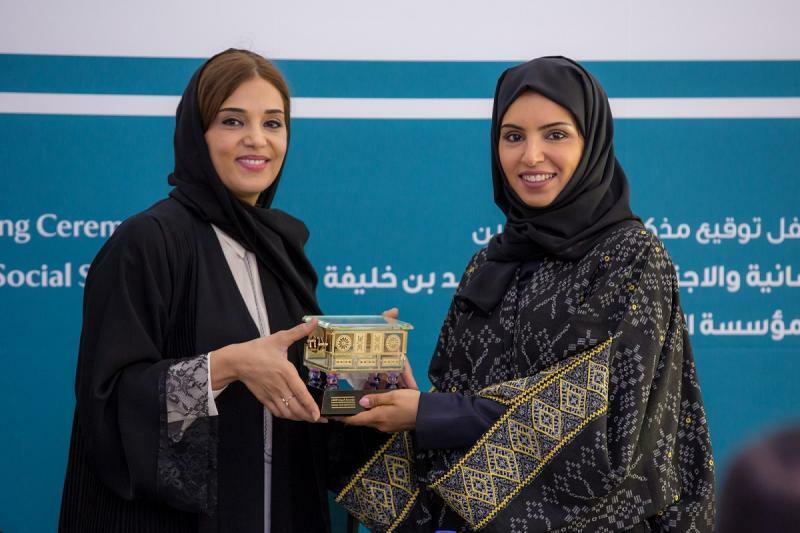 At the signing ceremony held in Education City, Dr. Amal Al-Malki, Dean of the CHSS, commented: “The College of Humanities and Social Sciences is pleased to collaborate with Doha Film Institute, who is one of our strategic partners. This collaboration falls within the remit of the College to actively engage with the local industry, in this case the film industry, and promote the importance of audiovisual translation, and translation and interpreting in general, as both academic and professional fields. The memorandum of understanding highlights the areas of commonality and the possibilities for innovative collaborations in combining translation studies and filmmaking. " The agreement demonstrates the interest of HBKU’s CHSS and DFI in making films accessible to sensory impaired audiences and marks a strong commitment by both organisations to work together on various workshops, projects, and events that serve the educational needs of Qatar and the region. In addition, the MoU will allow graduate students to collaborate with and learn from professionals working in media and translation. Last year, students from HBKU’s Master of Audiovisual Translation program, worked with DFI to include a special screening of the Qatari-produced short film, The Hero and the Message, at the Ajyal Youth Film Festival on the occasion of the United Nations (UN) International Day of Persons with Disabilities. The screening was the region’s first inclusive cinematic experience, with HBKU students responsible for the subtitling and audio-description of the film. As a result of the collaboration, both the visually impaired and hearing impaired were able to enjoy the short film. The MoU between HBKU’s CHSS and DFI creates the potential for similar community outreach initiatives in the future and establishes a platform for knowledge sharing, academic learning, and professional development. Through the agreement, the college and DFI hope to raise awareness of the importance of translation and filmmaking and promote high standards within both fields throughout the region. To learn more about the community outreach initiatives and partnerships of the university, please visit http://www.hbku.edu.qa/ .